Get the best tips and tricks for how to paint a room from an experienced DIYer and designer who has painted every single room in her home. At this point in my life (six years into our renovation), I have spent many many weeks (months?) total painting. While I’m not an expert, I thought I could pass along some of the tips I’ve discovered, sometimes the hard way, as an experienced DIYer. In my experience, the saying “you get what you pay for” rings true when it comes to choosing paint. Although the budget brands have come a long way in recent years, I still prefer premium paints such as Benjamin Moore’s Aura and Advance for walls and trim, respectively. Other premium choices that I’ve used personally and can vouch for include Sherwin-Williams Emerald, Magnolia Home for Kilz, Behr Marquee, and Valspar Reserve. Some experts recommend oil-based paint for trim and wood, although we have been happy with the results from using Benjamin Moore Advance. For painting cabinets and built-ins, a lot of experts recommend Benjamin Moore Advance as well, although we used Insl-x Cabinet Coat in our kitchen cabinet painting process with great results. One of the first decisions you’re going to have to make in the process of painting a room is which paint color to choose. There are so many factors that go into this decision, and I know it can be a bit overwhelming. You’ll want to consider natural light, the style of your home, your personal tastes, the mood you’re trying to achieve, and how different finishes in the room will compliment each other. 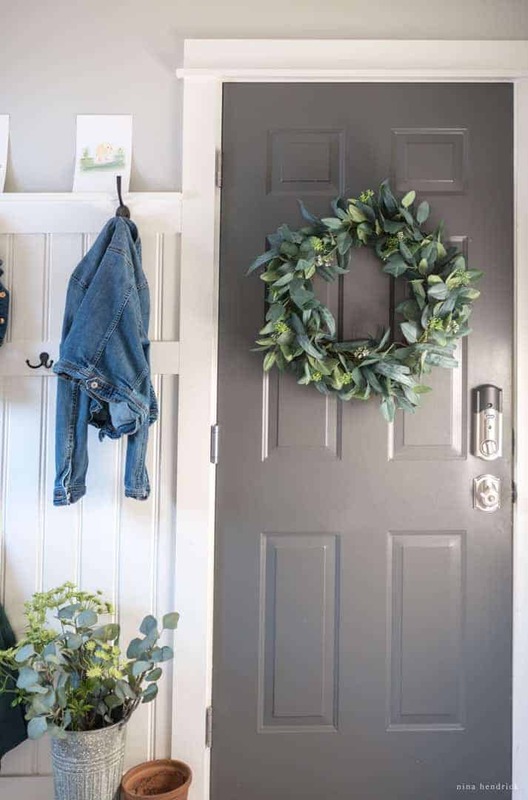 You can take a tour of the neutral paint colors I’ve used in our home here and you can get my free guide to help you choose a paint color by clicking below. How much paint should I use? With premium paint that includes primer we generally end up doing two coats. Even though many premium paints claim one-coat coverage, we’ve personally never found this to be true. When you’re going from a dark color to a lighter color a separate coat of primer is still a good decision, even with primer included in your paint. If nothing else, it will save you from a third coat of more expensive paint. When you’re going from a light color to an extremely dark one, a tinted primer can be helpful, although I haven’t found it to be necessary. The general rule of thumb, assuming two coats, is one gallon per 350 square feet of uninterrupted wall surface, but you always want to add around 10% for touch-ups and unforeseen circumstances. You can do the math yourself by calculating the square footage of your room (your doors and windows may even make up the 10% extra you need) and dividing by 350.You can also search for your preferred paint brand and “paint calculator”, the major brands all have that handy tool on their websites. How do I prepare a room for painting? Although I’ve been known to just restlessly begin painting a room while my husband is at work (sorry, Mack! ), it is really advisable to plan out your project, prep your space thoroughly, and gather the necessary supplies. Start the process by gathering what you need to complete your painting project. Although there’s an investment up front, many of these items can be used time and time again with proper cleaning and care. You can see my complete guide of painting essentials here! What is the correct order to paint a room? While this is a personal preference, and professional opinions vary, my preferred order of painting is the ceiling, baseboard and window trim, then walls. The reason I like to do things in this order is that I can be less exact with the ceiling and trim paint and then cut in with the wall paint. If you are taping off, there is a significant waiting period for curing between painting the trim and then taping it off to painting the walls (as long as a month, depending on your chosen paint), so that may be something you want to take into consideration when determining your order. It’s best to begin a painting project with a blank slate. Remove smaller items and decor. 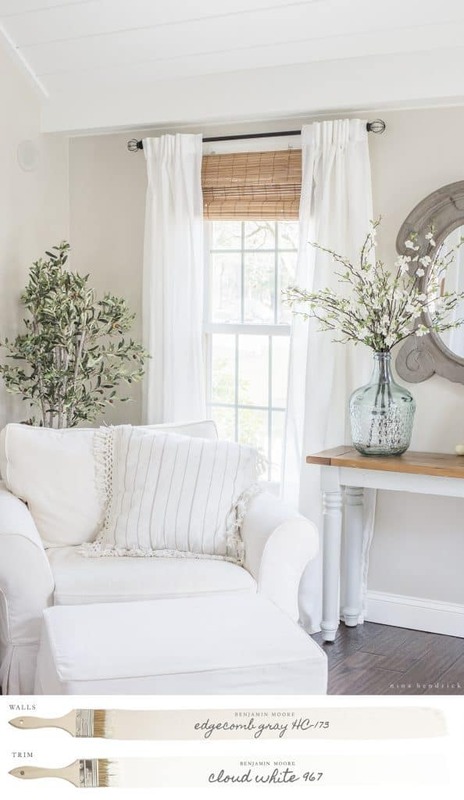 Furniture and other large items should be brought either out of the room or if that isn’t possible, to the center of the room and covered with drop cloths. The floor should also be protected because no matter what, drips and spills happen. We either use a sturdy masking paper taped down to our wood floors with painter’s tape, canvas fabric drop cloths, or plastic sheeting secured with painter’s tape. Additionally, we use a piece of cardboard underneath our paint can or bucket for an added layer of protection. If your house is anything like our 1980s colonial, you may need to do some extensive wall prep in order to give yourself the best paint coat possible. If your walls have any sort of paint treatment, such as sponge painting, sanding may also be required. You will also want to fill any nail or tack holes and divots with a spackling compound (I prefer Drydex) and a flexible putty knife. If you have a large hole or are getting rid of an outlet, we’ve had great luck with these wall patch kits. Once any of your filled holes or patches are dry, make sure to sand with fine-grit sandpaper or a sanding block. Please Note: Homes built before 1978 may contain lead paint, which can be hazardous when disturbed. If your home was built before then, it’s best to have your paint tested before you begin prep work. Here’s some information from the EPA that may be helpful! As I learned the hard way with our cabinet painting project, you always need to fill any gaps (such as between walls and trim) before painting. The best way to do this is with a paintable latex caulk and a caulking gun. Fill the crack with a thin bead of caulk, Then use a damp lint-free towel, sponge, or finishing tool to smooth it out before it dries. Generally, caulk is not able to be sanded, so it’s best to work quickly and in small areas to ensure a smooth finish. If you are painting trim, the same general rules apply as what I mentioned above. If your trim is polyurethaned wood, you will want to clean with a solution of TSP substitute or a product such as liquid nails. You will want to fill any nail holes, divots, or cracks with a spackling compound. You will want to sand the trim with fine-grit sandpaper until a polyurethaned surface is roughed up a bit. This enables the paint to adhere better. Any spackling should be sanded until smooth. The gap between the trim and the wall should be filled with caulk as mentioned above. Make sure that any dust, dirt, or sanding debris is vacuumed away and any dirt or stains are wiped away with a damp sponge. Cobwebs can also complicate painting projects, so make sure that all corners are dusted nicely. Ah, my least favorite step. Unless you are completely confident in your steady hand, you’ll want to make sure to tape off using a high-quality painter’s tape. Again, this is a situation where you get what you pay for. I advise you to use the name brands such as Frog Tape or 3M Blue. Contractor packs of generic painter’s tape have been known to take paint finishes right off the wall or crimp so that paint runs below. You can follow the painting hierarchy I mentioned above, but this can also be a matter of personal preference. Make sure that any painting you’ve already done has cured for the amount of time recommended on the paint can. The key to a clean edge is to make sure that you can get the longest, straightest runs of tape possible. Press firmly along the edge that will meet the paint to about the middle of your piece. You don’t have to press as firmly against the other side. I actually find that the tape removes more cleanly if that side is not firmly pressed down. Curves or strange shapes may require you to use many small pieces of tape, or a utility knife to get a clean edge around the shape. It is extremely important that you always use proper ventilation. Always try to plan painting for times when the weather permits the windows to be left open. A box fan in the window is also a good practice for circulating fresh air. Make sure to take plenty of fresh air breaks. Children, pregnant women, and anyone with health and breathing problems should be kept out of spaces that are being painted and even freshly painted spaces for a few days. 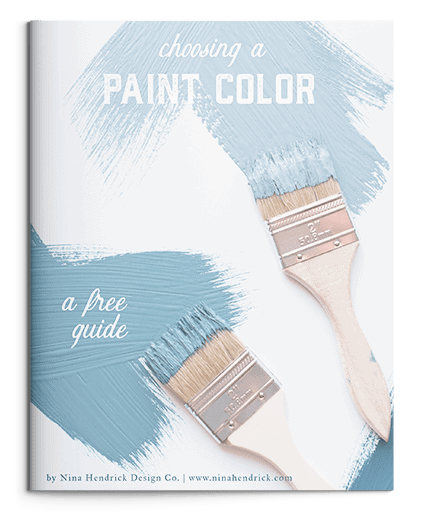 You can check this guide from the CSPC for more safe-painting practices! Priming can be helpful if you’re going from a dark wall color to a very light color. If you are painting a wall very dark it is sometimes recommended to use a tinted primer. However, I have found this to be unnecessary when using premium paints. If you are painting a freshly plastered wall or bare drywall, you should always prime first. I prefer Kilz Latex Primer or Zinsser 1-2-3. For varnished wood trim or bare wood, I recommend priming with Kilz Original Primer, which is oil-based. Because it is oil-based, you will want to be especially conscious of proper ventilation. If your trim is primed or painted already, you can generally skip this step. Open your paint with either a thick flathead screwdriver or specialty paint tool. Mix your paint well with a wooden stir stick. Since pigments tend to sink to the bottom, especially make sure that you are scraping the bottom of the can as you stir. Lay out your piece of cardboard and pour your paint into a tray and a hand-held paint bucket. My first step when painting a wall is to do the cutting in around the perimeter with a brush first. You should use a 3” angled brush for this. Try to keep your brush sufficiently saturated with paint without dripping. Dip the bristles in a couple of inches and then tap off the excess paint. Try to put on a fairly thick coat working in sections of a couple of feet at a time. Once the perimeter of one wall is cut in, you can begin to use your roller on that wall. Where two walls you are intending to paint meet, you can brush the edge of each wall and in the corner itself. This will help you carry your wet edge after the next step. You should have already poured your paint into your roller tray. Lightly roll your roller into your paint. Then roll back and forth on the ribs of the tray until you cover your roller evenly. Like your brush, you want a sufficient amount of saturation but no drips. Roll your wall in strokes that mimic a “W” shape, filling in as you go. Carefully roll over your brush strokes as much as you can without hitting the edges. This smooths the brush strokes and ensures even coverage. Try to avoid rolling in straight lines, as this shows. Allow to dry for the recommended time, then repeat for your second coat. For painting trim, I prefer to use a two-part method. You can use a handheld paint bucket with a liner. Also, fill a mini roller tray with the same paint and a liner. I use the paint tray liners because the paints for trim are sometimes harder to clean off than traditional latex paints. Examples of this are Benjamin Moore Advance and any oil-based paints. Next, you prepare the mini roller with a smooth foam roll. You then evenly coat it with paint using the method of rolling it repeatedly on the tray ribs. First, you should use a 2” angled brush evenly coated to apply the paint to a section of trim. Then, go over the brush strokes with the saturated (but not dripping) foam roller. This ensures a more even coat. Although the paints often have self-leveling properties, I still find that this gives me the least brush strokes. Your first step will be to remove all hardware. If possible, lay the door flat on two sawhorses. If your door is wood, you will need to wipe down with tsp substitute or liquid nails and roughen with sandpaper. Then, make sure the dust is cleaned off, and prime. The best way for painting doors, in my opinion, is with a paint sprayer. It’s a job I find to be pretty challenging. If that isn’t a possibility, you can get a good finish using the same method as painting the trim. Brush on a coat that is heavy but not dripping, and smooth with your saturated foam roller brush. Although time-consuming, I do believe taping off and adding masking paper between mullions is a necessary step. As with regular doors, my opinion is that this is a job best left to a paint sprayer. However, you can use a small 1” brush and repeat the steps outlined for painting trim. Sometimes the paint gets on the panes. When it dries you can spray with glass cleaner and use a flat razor blade to scrape. Make sure to check the warranty on your windows beforehand, as this voids the warranty on some new windows. You can store your paint brush, roller, and even paint tray in zipper baggies or tightly sealed plastic wrap for several days. With this method, you don’t have to wash them out until you are done with the project. The key is keeping the air out, the air can ruin your supplies. I’ve mentioned that the investment is worthwhile when it comes to paint and painting supplies. You want to make sure you’re protecting your investment and caring for your supplies properly. Always make sure paint cans are properly re-sealed by tapping them closed with a rubber mallet. Decant smaller paint remnants into a small airtight container or jar and label with the paint color. Paint should be stored on a shelf at a temperature between 60-80 degrees Fahrenheit. Make sure to wash out your brushes and trays. You can wash brushes with a drop of dish soap in lukewarm water until the water runs clear. You can also remove flakes with a metal comb. Wrap the bristles in a paper towel as the brush dries. These steps will ensure that your brushes last a long time. You should rinse paint trays well and lay them out to dry. If you use a tray or bucket liner make sure to dispose of it. 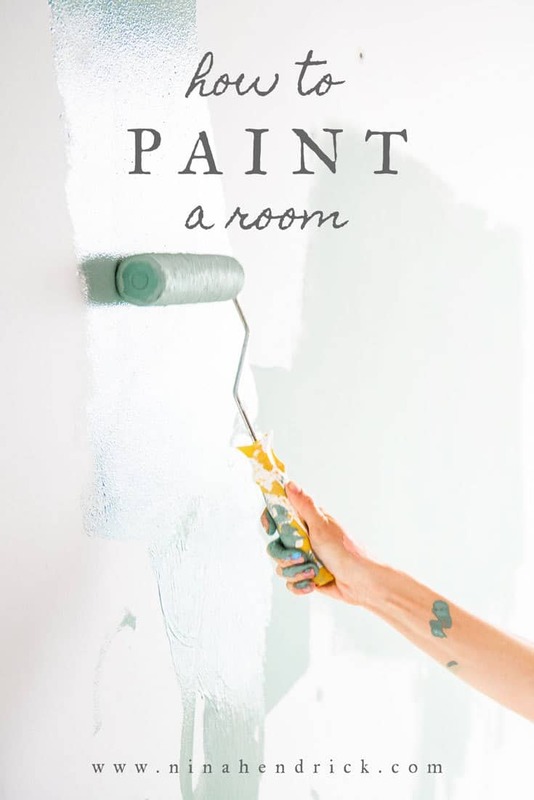 Now you know my favorite tips for how to paint a room! All in all, painting is a process where you get out of it what you put in. If you take your time, use quality products, and pay attention to detail you can achieve professional-quality results that will last you several years.